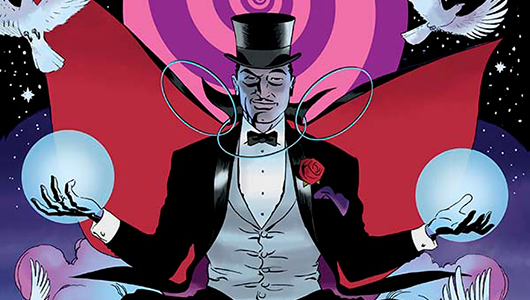 King: Mandrake the Magician #1 is the latest installment of Dynamite Entertainment’s miniseries starring all of King Features’ characters on their 100th anniversary. Previously, we’ve seen Flash Gordon, The Phantom, and even Jungle Jim! This time, the spotlight falls on Mandrake, and his turn in defending the Earth against the forces of evil. Will he succeed? Let’s find out! Before Sesame Street and The Muppet Show existed, Jim Henson and his writing partner Jerry Juhl were still trying to find their way into bigger television markets. After finishing up their first television project Sam and Friends, as the foreword to this book explains, they began plotting out new programs and feature length films. One of the programs, a Thanksgiving Day special, never made it to the air. 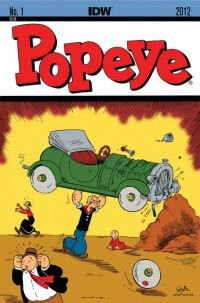 But enough of the original material survived and found its way into comic form. The Musical Monsters of Turkey Hollow follows a young boy named Timmy who comes across a group of monsters that speak in music. They help him learn guitar, which astonishes his sister Ann as her lessons didn’t seem to be taking hold. They also cause a bit of strife for Timmy, and Mr. Sump uses them as an excuse to get Timmy’s family kicked off their farm so he can have it all to himself. Rabbles are roused, hijinks ensue, and at least two shots are fired (don’t worry, no one gets hurt) in this tale of friendship and song. 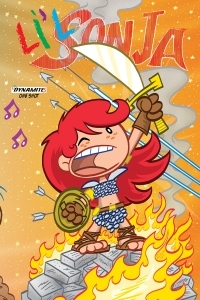 Lil Sonja #1 is not only enjoyable for people who read the regular title, but it’s the PERFECT gateway for younger readers (both girls AND boys) to be introduced to the character. There’s only problem…. Writer Jim Zub pulls off a writing assignment that I can only assume was pretty daunting. Turn the She-Devil with a Sword into a playful little girl that goes on adventures. While clothed. Thankfully, he pulls it off quite successfully, all the while not dumbing down the character to make it unreadable for guys like me who’ve been reading Red Sonja since the early 1980s. It really is a classic “kid’s comic” like the old Harvey comics that could be read and enjoyed by both children AND their parents. I’ve always likened the Paul McGann era of Doctor Who to be the transitional stage between Classic Who and Nu Who. Despite having only been in one television adventure, the McGann incarnation of the Doctor is interesting in that this 8th version of the Time Lord has had possibly more explorations in print than most of the other Doctors. 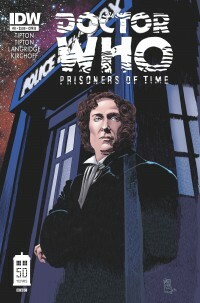 So it was with great anticipation that I received the eighth issue of Doctor Who: Prisoners of Time, focusing on the McGann Doctor. Although it’s never specified how far along in his incarnation he is within the confines of this issue, the comic finds him arriving back in San Francisco in February 2000, to meet up with his companion from the TV movie, Grace. 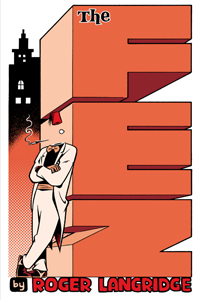 Just like an old-fashioned short before a feature film, The Fez #1 by Roger Langridge (winner of both Harvey and Eisner Awards) offers up a sample-sized dose of action and laughs starring his charming title character. This invisible (and yet somehow still dapper) hero doesn’t speak a single word in the mini-comic, but Landgridge has managed to fill The Fez with enough personality that he practically pops off of every page. The two vignettes showcased in this launch introduce a character that’s more chaotic neutral than your stereotypical action-adventure lead. In the first story, told from an enemy’s point of view, The Fez presumably rights a wrong and manages to nearly drive that foe bonkers during the process. Really, how could you not appreciate a hero who stalks his enemy (who may or may not be evil) and basically annoys him simply for his own pleasure? 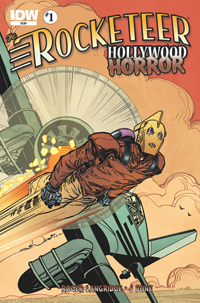 The Rocketeer: Hollywood Horror #1 is just about as close to a perfect comic book as you can get. Whether you’re a fan of this character or not, you WILL enjoy this great first issue and look forward to the rest of this miniseries. First off, it’s nice to have a Rocketeer series that is NOT an anthology. Sure, those were GREAT, but it’s nice to dive into a deeper, flushed-out story, and believe me, there is PLENTY of story in this first issue. Writer Roger Langridge takes us back into the world of Los Angeles in the late 1930s, a simpler time if you will, but one that is NOT boring. In fact, there’s more going on 75 years ago than I bet there is in most people’s lives right now. Cliff has to deal with a couple of mad scientists, some gangsters, and of course, his very adventurous girlfriend, Betty. From first page to last, this book is pure fun and excitement! Comics have a deep history with the western genre. For many years weekly books were filled with hard-talking, quick-shooting cowboys and vigilantes. Needless to say, it is a form that is constantly being reinvented for new and interesting content. Nate Cosby (Jim Henson’s The Storyteller, Pigs) and Chris Eliopoulos (Franklin Richards: Son of a Genius, Misery Loves Sherman) have taken the western in an entirely new direction with their new comic Cow Boy: A Boy and His Horse. Cow Boy: A Boy and His Horse tells the story of Boyd Linney, a 10-year-old bounty hunter who is on a hunt for his very own family. Cow Boy also features four western short stories from Roger Langridge, Colleen Coover, Brian Clevinger & Scott Wegener, and Mike Maihack. I was fortunate enough to be able to talk with Nate and Chris about the origins of Cow Boy, as well as what it was like pitching the story of a child bounty hunter to publisher Archaia Entertainment. Most all-ages comics try to avoid the hard, harsh realities of growing up. 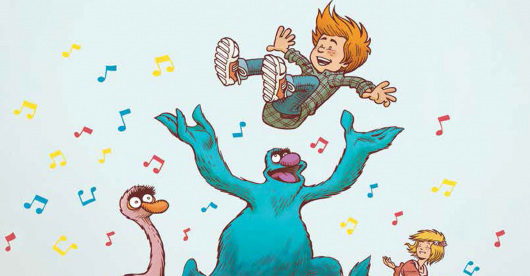 The idea is to typically remind readers that being young is supposed to be full of wonder and magic. 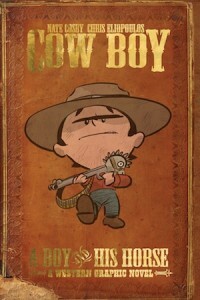 Nate Cosby and Chris Eliopoulos take the alternate road in their graphic novel Cow Boy: A Boy And His Horse. The story’s main character, Boyd, is a 10-year-old bounty hunter on the hunt for his own criminal family. Growing up just got a little harsher. Cow Boy: A Boy And His Horse is a beautifully written and illustrated graphic novel that reminds us that sometimes our parents are not always good people. 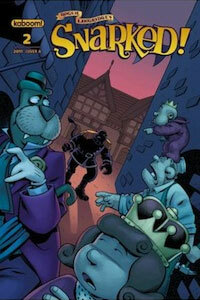 Snarked by Roger Langridge returns this week with its second issue. It’s an issue full of character development and surprising revelations that was a joy to read. It is usually around its second issue most comics prove if they are going to continue in greatness or if its creator used all of their artistic brilliance in the first issue. Langridge luckily beats the sophomore slump with Snarked #2 and continues to take us on an unforgettable journey with a cast of charming and lovable characters.